In 1998 we lost the National Postal Museum at London's King Edward Building. 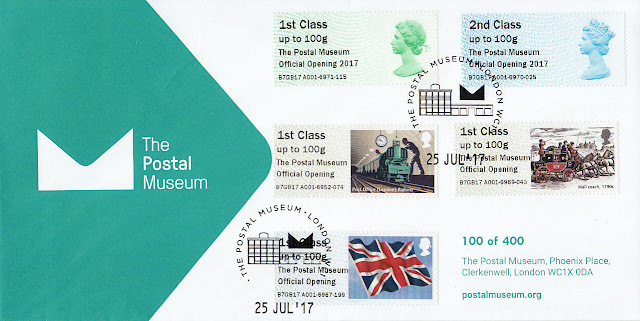 After some years in the wilderness the limited-scope British Postal Museum and Archive opened, was nearly relocated to Swindon, but today the totally new Postal Museum is open to the public. For some reason they chose not to use the original title, although that would have made sense as the country has at least one other postal museum, in Bath. Thanks to Chris we can show one of the first day covers sold to mark the opening, bearing the five different Post and Go stamps available, with the various additional inscriptions - some with the year and some without. Note that although 28 July is the official opening day, the Post and Go machine was available on 25 July to enable collectors and dealers to buy their stamps in advance of the very busy opening day. The first day cover is therefore dates 25 July - and the stamps are cancelled with the new Postal Museum permanent postmark. Not a great deal of space left to add an address if you wanted one, is there? I also saw the feature on the London News on Friday evening and thought the same as Doug. What a pity they did not show a bit of the main museum which was open instead of the Mail Rail which does not open to the public until September. The preview day on Tuesday appeared to be well attended by Post & Go collectors and as Doug also says the young lady looking after the Post & Go machine did a sterling job as she always does. The parts of the Museum that I saw looked very good and most interesting.